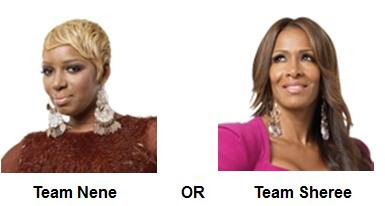 VOTE: Are You Team Nene or Team Sheree? You Betta Call Tyrone! OJ&B Key Terms To Know: Grown Lady Conversation- A conversation that takes place in the afternoon in the middle of a wine bar consisting of two cell phones, a four-way conversation, plenty of yelling and a plethora of calling out a person's physical features and financial troubles. Said "Grown Lady Conversations" usually end with one party storming out while the other party yells and chases them outside. Last night was the season 4 premiere of Bravo's The Real Housewives of Atlanta entitled, "Nothing Ventured, Nothing Gained." The ladies of Atlanta waste no time at all by bringing full frontal drama into the very first episode when Nene Leaks and Sheree Whitfeild sit down to have a "grown lady conversation" about a business deal gone bad. Apparently Nene was trying to take money from Sheree and Nene was very offended that Sheree did not trust her as a friend and as someone that she has known for longer than Tyrone, who Sheree has been working with. We also learn that apparently Nene had rotting teeth but has since turned that situation into a $50,000 smile (she better work) and that Nene does NOT have to sit down! All I know is that these ladies know how to bring the heat! Maybe that is why they call Atlanta "Hotlanta." ALT must be filled with so many sassy ladies that are not afraid to tell you what time it is and put you in your place in the middle of a wine bar and afternoon. What did the owner think? Now that you have all of the facts it is time for you to tell OJ&B one thing... Are you on Team Nene or Team Sheree? VOTE NOW!! !